The judgment upon Israel will become severe before the redemption comes. Here is one illustration of the bad conditions. Our photos were made at Haran, the home of Abraham and his family before they departed for the promised land (Genesis 11:31 – 12:5). Haran is a few miles north of the Syrian border in Southeastern Turkey. 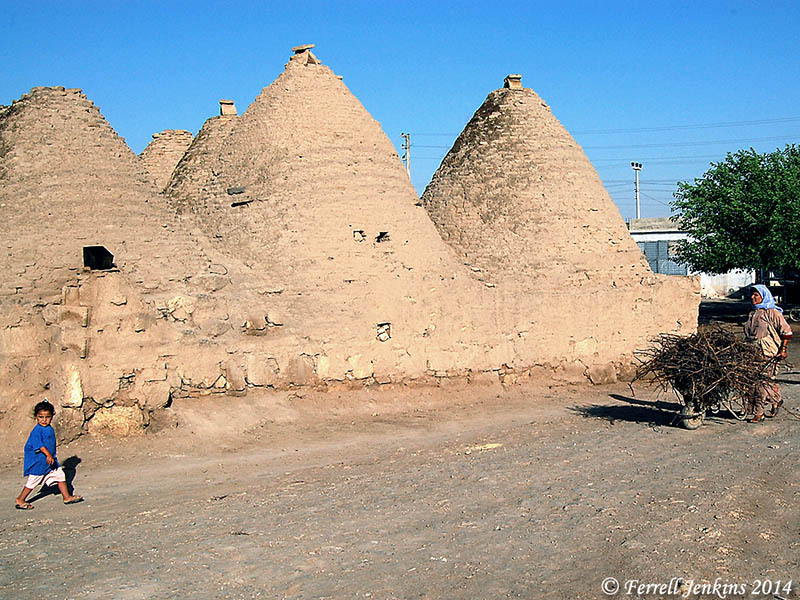 The beehive mud houses have been in use here for several hundred years. The first photo shows a woman bringing in dry branches to her house to use for building fires. Woman carrying dry boughs at Haran. Photo by Ferrell Jenkins. 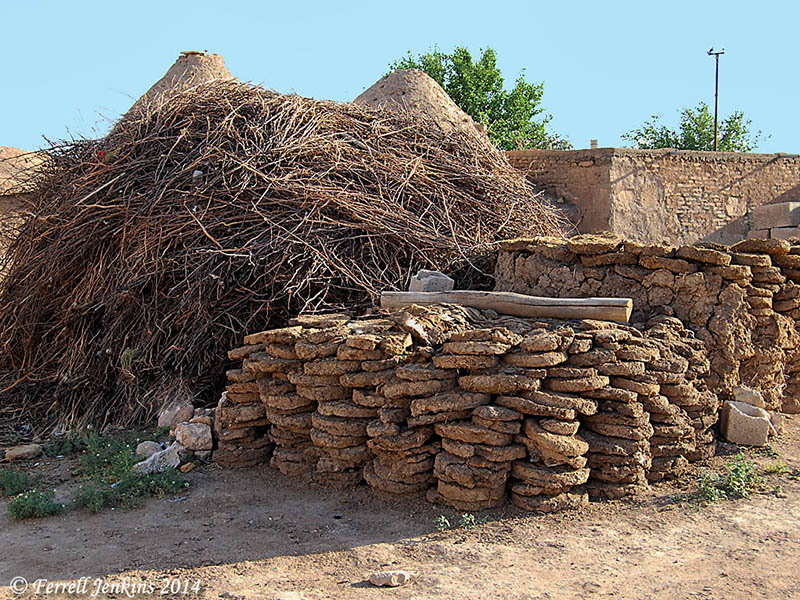 And the photo here shows a large supply of dried boughs and a large stack of dung cakes which will be used to make fires for cooking and heating. Dry boughs gathered for fire at Haran. Photo by Ferrell Jenkins. Those who preach and teach might enjoy, and profit by, Preaching and Teaching From the Old Testament by Walter C. Kaiser, Jr. The 2003 book is $3.99 today in Kindle format. It is normally $22.00. Click on the book for more information. Isaiah’s readers should find consolation in the fact that the city that was to be devastated by the Babylonians would eventually be rebuilt. A remnant of Judeans returned from Babylonian exile in 536 B.C., with a second group returning in 458 B.C. (Isaiah 10:21-22; 2 Chronicles 36:23; Ezra 1; 9:13-15). Nehemiah came to Jerusalem in 444 B.C. to lead in the rebuilding of the walls of the city. 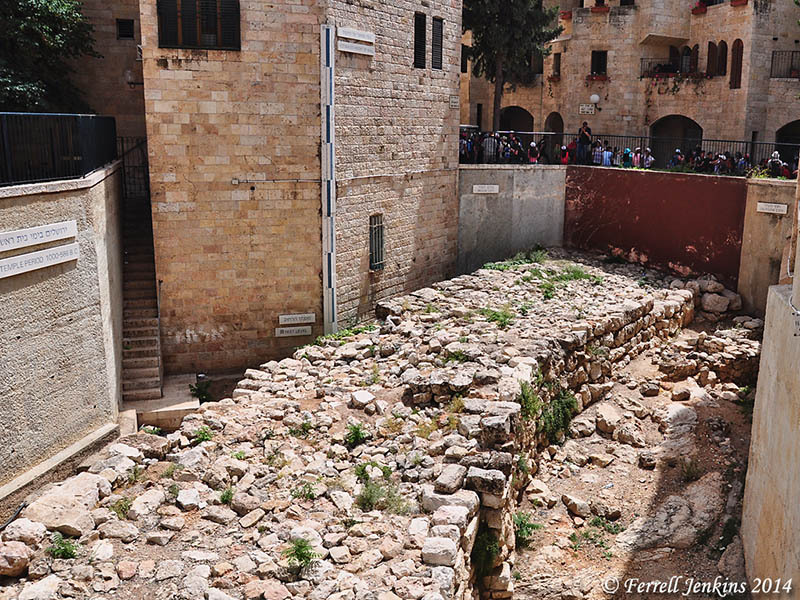 The photo below shows the foundation of a large wall thought to be the “Broad Wall” of Nehemiah 3:8 (see 12:38). The wall, excavated after 1967, was originally about 25 feet high. The “Broad Wall” in Jerusalem. Photo by Ferrell Jenkins. Prof. Eilat Mazar believes she has discovered a wall dating to the time of Nehemiah (Persian Period) in the City of David excavations. If so, this would mean we have portions of the wall on the west and on the east side of the ancient city. 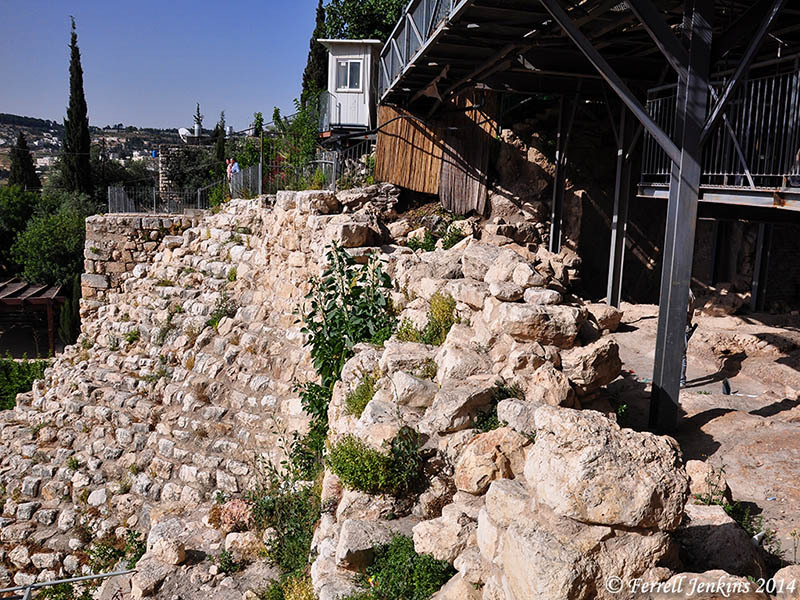 Possible portion of wall (right) from time of Nehemiah in the City of David. Photo by Ferrell Jenkins. Isaiah continues the apocalyptic description of the judgment of the LORD and the return from captivity. The city that will be destroyed by the Babylonians will become a place of great feasting for all nations. Early in the book Isaiah has informed us that “the mountain of the LORD” would become a place for blessing all men through the word which would go forth from Jerusalem. Jerusalem is not directly on the top of the central mountain range that runs from the north to the south in the land of Canaan/Israel. It is situated on the eastern slope of the mountain ridge. Even then there are mountains that are higher. 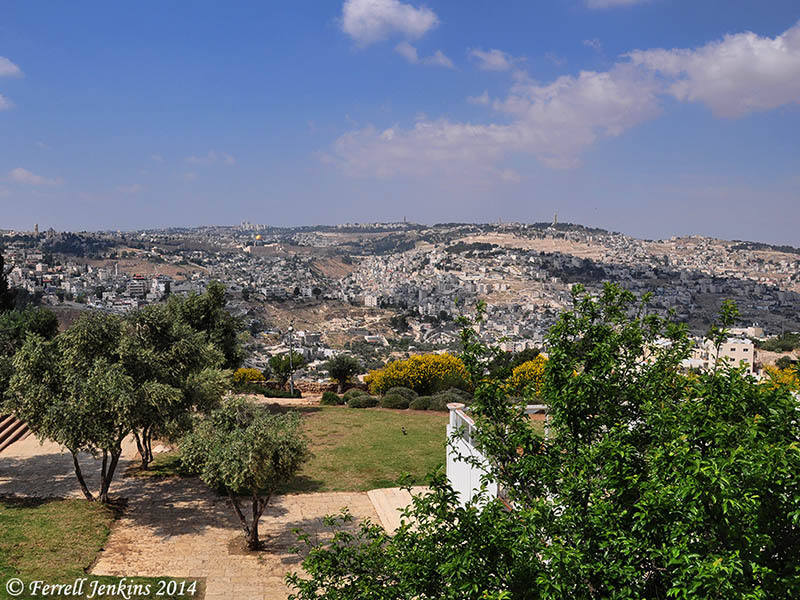 In the photo below you see the Old City of Jerusalem, where the Temple of Solomon once stood. But you see that Mount Scopus and the Mount of Olives are higher than Jerusalem. In God’s plan Jerusalem would become the highest of all. We see the fulfillment of this in Acts 2. Notice Jerusalem in the mountains. Photo by Ferrell Jenkins. The photo above was taken from the Haas Promenade south of Jerusalem. Click on the photo for a larger image and a better view of the city. The normal activities of life will cease when the judgment of God comes upon Judah. The photo below shows clay images of women playing tambourines. 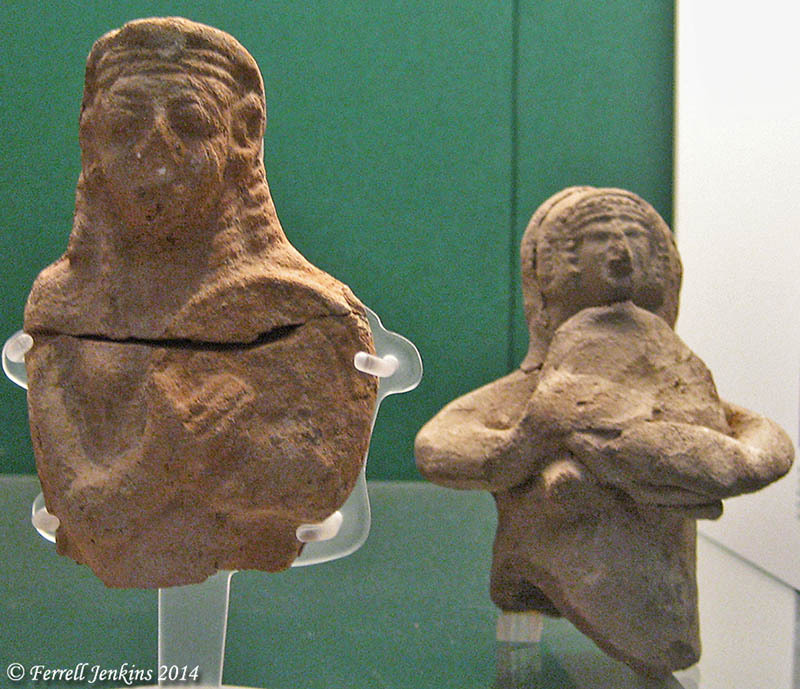 These items are part of the Bethlehem Group of mostly pillared figurines, now displayed in the British Museum. Female musicians from Bethlehem. British Museum. Photo by Ferrell Jenkins. 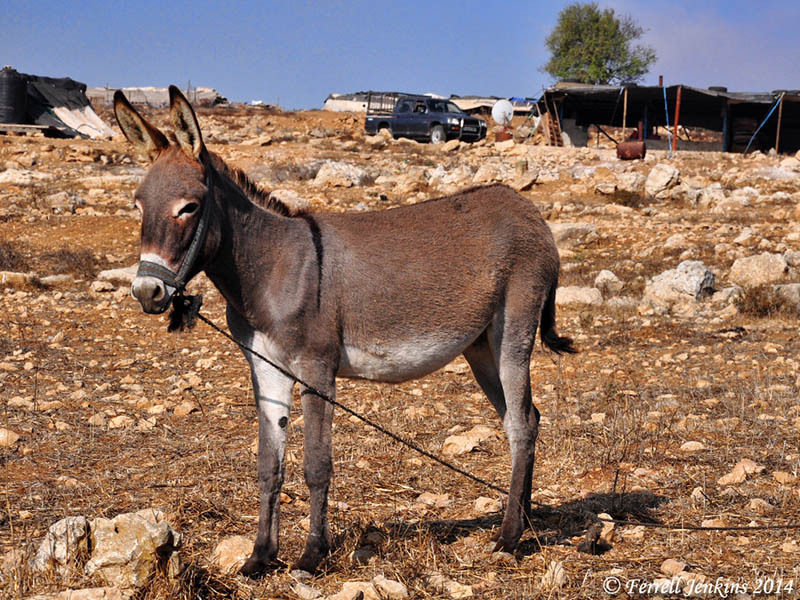 A rabbi and his student were arrested for trying to kill a donkey as a sacrifice for sins, according to a report in The Jerusalem Post here. The article says this took place “near the Tomb of Samuel the prophet which is located in the West Bank north of Jerusalem.” I assume the reference is to Nebi Samwil, the traditional burial place of the prophet Samuel. 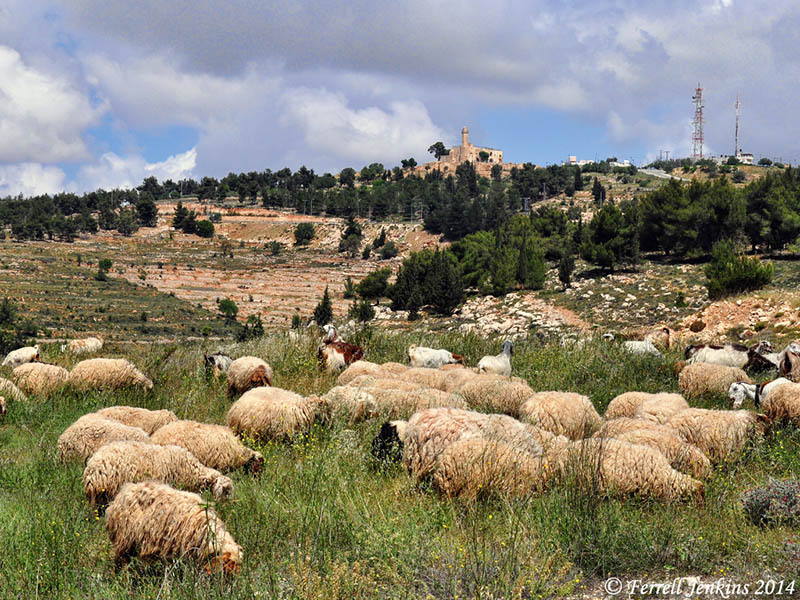 Nebi Samwil is easily accessible within Israel, but is located on the border of the West Bank. The site overlooks the Benjamin Plateau. You can see the Arab town of El Jib, biblical Gibeon, from Nebi Samwil. The photo below shows Nebi Samwil from the south. Nebi Samwil from the south. Photo by Ferrell Jenkins. A short distance north of Nebi Samwil, within the West Bank, some Bedouin have settled with their tents, donkeys, trucks, and satellite dishes. Donkey north of Nebi Samwil. Photo by Ferrell Jenkins. Read more: “The donkey: beast of burden” here, and “Don’t underestimate the donkey” here. The sacrificial system of the Mosaic law required grain, drink, or animal offerings. The prescribed animals include lambs (male, female), goats (male, female), bulls, pigeons, and turtledoves (Exodus 29:38-42; Numbers 28:3-8; 15:22-26, et al.). Donkeys are not among the animals accepted for sacrifice during the Mosaic period. Christians believe what the writer of Hebrews says about these Mosaic sacrifices. We believe that Jesus, as the lamb of God (John 1:29), made a single offering for the sins of those who respond to Him. If we seek the forgiveness of the LORD Almighty we must comply with His requirements. The photo below shows a portion of the western wall of the Old City of Jerusalem. There are ruins here belonging to the time of John Hyrcanus (2nd century B.C. ), but most of what we see belongs to the Turkish construction from the 16th century A.D. The large structure is known as the Citadel. Jaffa Gate is out of sight on the left side of the photo. 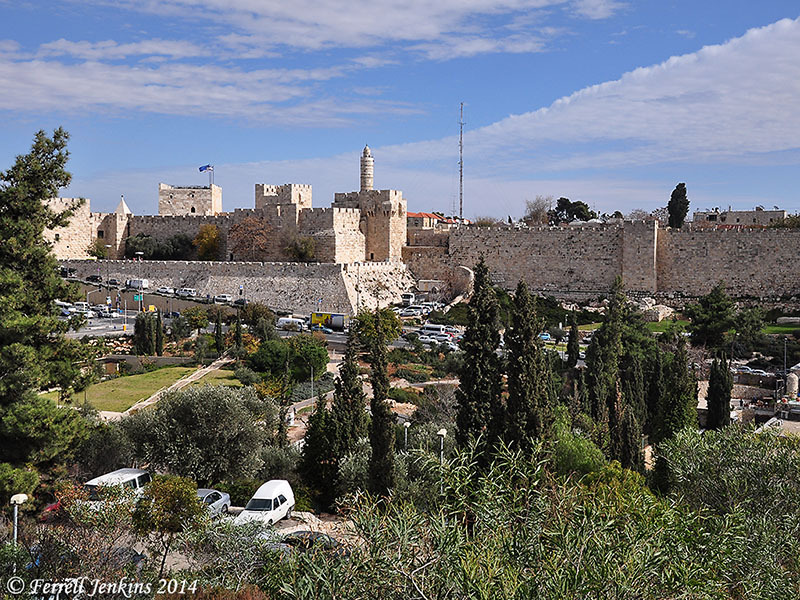 View of the Citadel and the Tower of David. Photo by Ferrell Jenkins. Our photo was made from Paul Emile Botta Street near the King David Hotel. The French excavator Botta is known for his discovery of the palace of Sargon at Khorsabad in northern Iraq.